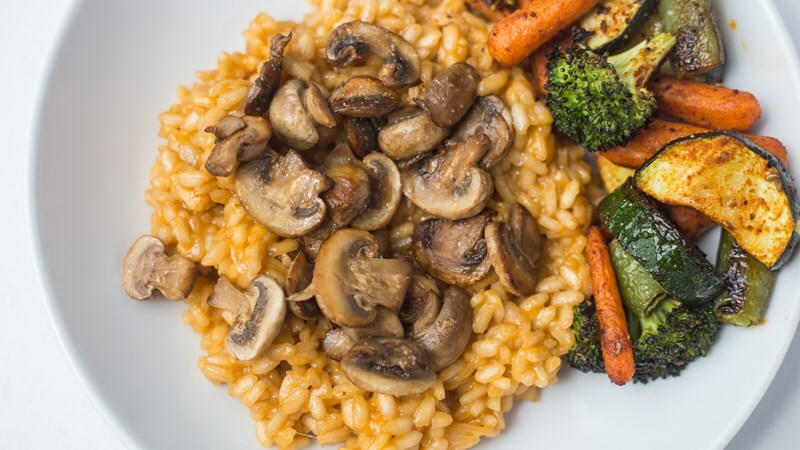 Mushroom Risotto w/ Roasted Veggies — Happy Food Co.
Ready in 35 Minutes | Gluten-Free | For the best experience, please skim through the steps before you start cooking. ARRANGE the mixed seasonal veggies (except the mushrooms) on a baking sheet. DRIZZLE with olive oil and gochujang and season to taste with salt and pepper. Toss gently to combine. MELT 1 butter ball in a medium skillet over medium heat. MIX the vegetable broth concentrate with 3 cups of hot water in a liquid measuring cup. STIR and simmer over medium heat until the rice is tender, about 30 minutes, turn off heat when finished and season with to taste with salt and pepper. MELT 2 butter balls in a small skillet over high heat. ADD the mushrooms and sauté until golden brown. Step 5: Combine the Risotto Ingredients, Serve and Enjoy! ADD the sautéed mushrooms and parmesan cheese, stirring until combined.